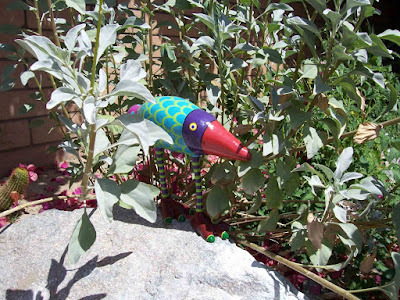 There's a toy in my yard! Well, here's the Desert Holly, a nifty little complex at Sunset and Tahquitz. I used to live there, and it's very mid-century modern. 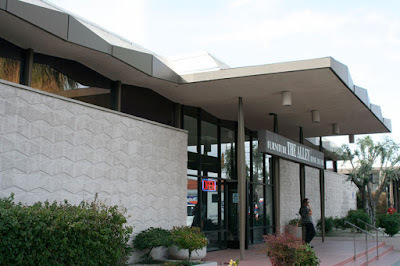 It was built in 1955 and designed William Krisel of Palmer and Krisel. I'll get more pics of this baby later. 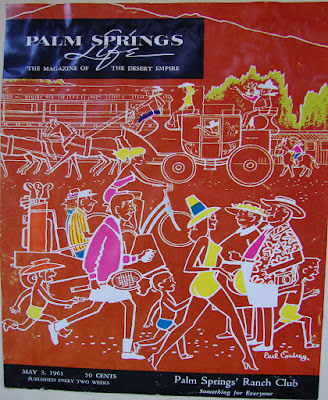 Earl Cordney drew this picture for Palm Springs Life in 1961. I have no idea who this guy was. He's not listed in Google. However, the cover's kind of cool. Our desert has numerous washes. A wash is a low area that strips through the desert for miles. It replaces gutters so that when it rains or when the snow melts from the mountains in spring, the water is caught in the wash. I once rode my bike through the wash that cuts through Cathedral Canyon and got $100 ticket from the Cathedral City police. When it rains a lot the wash is full of flowing water and it's dangerous to cross. The time I got the ticket there wasn't all that much water in it. But I did go though a street closed sign, which is why I got the ticket. No hotel opening is complete with out the Chamber of Commerce. The Chamber publishes a Business Referral Directory which lists the partner member businesses. It also has a member to member service directory. When a business member wants to offer a discount on a product or service the chamber will help spread the word through an issue of Member to Member Specials. My question is where do you pick up a copy of this publication? My guess is at the chamber offices or at the welcome center when you drive into town. If anyone knows, please comment. The Chamber has a listing of events for all here. 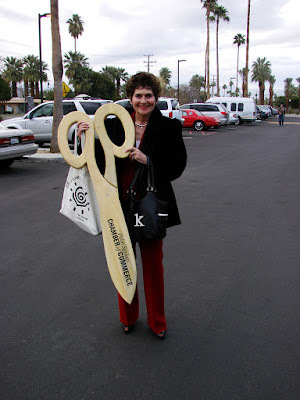 Oh, and doncha just love the scissors. What do they symbolize? Now why would they have belly dancers at a party celebrating the opening of the Holiday Inn in Palm Springs? Because belly dancers are symbolic of the desert. Think about it all over the Arab world belly dancers shake their hips at exotic clubs throughout the Middle East, lurid fun (at least to some) that seems a world away from the the calls to prayer heard on the streets there. 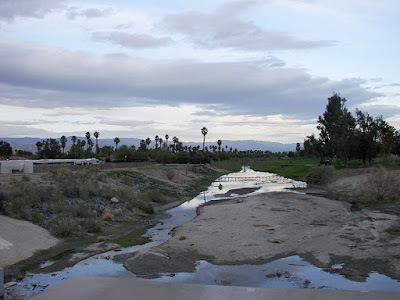 Come to think about it our desert (the Coachella Valley desert) hums with Arab-speak from the naming of streets (Arabia Street in Indio) to the Date Festival (dates are also big in the Arab states) that's happening right at this very minute. 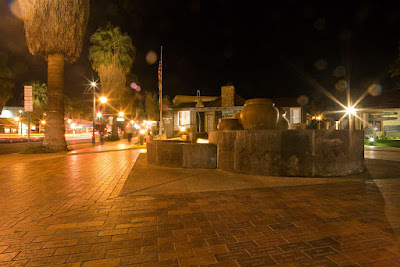 Palm Canyon Drive at night is filled with lights, shapes and forms. Photographing it from a variety of perspectives keeps me busy. This shot is looking south from a fountain located just north of the intersection of North Palm Canyon and Tahquitz Canyon Way. 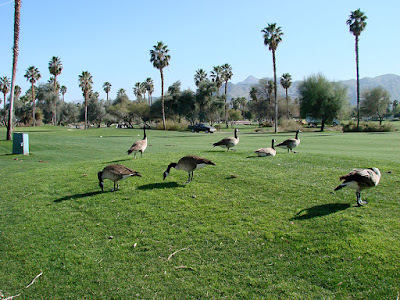 It was late September last year when I wrote of the geese passing Palm Springs on their way south for the winter. I posted a picture of them at their rest stop, which was at a lake inside a Palm Springs golf course. They arrived back within the last few days on their way back north to Canada for the summer. These great birds are fascinating to watch. I figure they'll be back in Canada by early May. Let me know if I'm wrong. 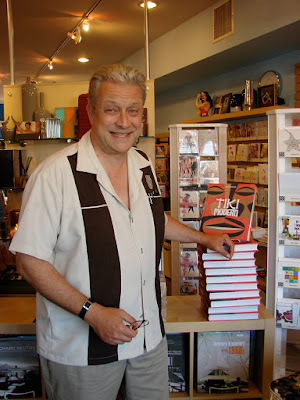 Sven Kirsten appeared at the store, "Just Fabulous" yesterday, hawking his latest book, Tiki Modern. He says it's way different than his first book, "The Book of Tiki" published a few years ago. Tiki is the Polynesian God all worship here in the desert to brighten up the white walls of modernism. Go ahead and click on the link below to get your copy. I'll get 4 percent of the sale. Like, big deal. Well, every little bit helps. CHECK OUT SOME CAMERAS AND CAMERA ACCESSORIES. Charles Luckman and William Pereira were the architects for this building (see above). Though not household names like Albert Frey, William Cody and E. Stewart Williams, they designed a slew of buildings all over the western United States. Before this store was The Alley, it was Crown Books and before that it was Robinson's Department Store. It was built in 1960. 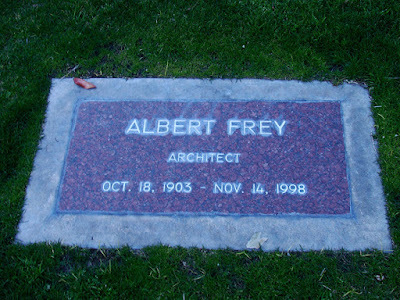 Albert Frey is buried in the Welwood Murray Cemetery, which is at the western edge of Chino Drive. There's a low wall in back where you can enter. Albert Frey's grave site is right near that wall. Frey's architecture is all over Palm Springs. 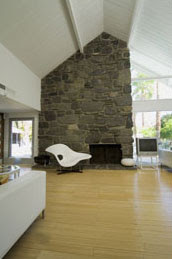 He had a minimalist style, emphasizing the natural world by building so that the outside world comes in. Steel, concrete, and floor to ceiling glass were some of his trademark building materials. 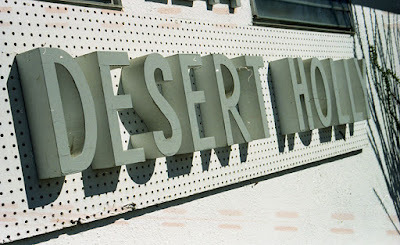 Modernism Week comes to Palm Springs from Feb.15-24. 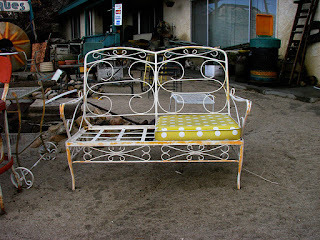 Tonight, though, you'll get a special peek at the crowd of hipsters that make up today's modern Palm Springs. The Gands play at the Oasis Nightclub at 611 S. Palm Canyon beginning at 7 p.m. Everyone who's anyone will be there. 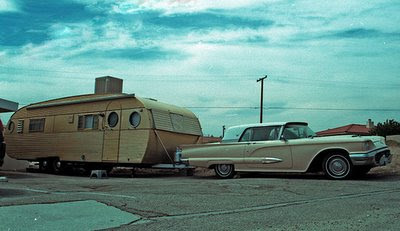 Modernism Week is an annual celebration of mid-century modern design. All week long there are events such as the Modernism Show beginning at on Sat., Feb. 16. 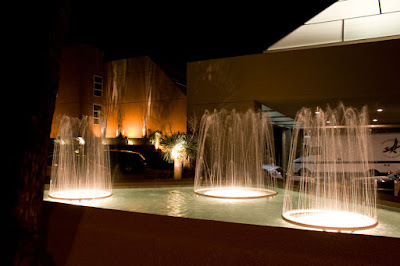 The events involve the Palm Springs Preservation Foundation, Palm Springs Historical Society, Palm Springs Modern Committee, Palm Springs Chamber of Commerce and the Palm Springs Art Museum. There are a slew of activities throughout this weekend and next week. 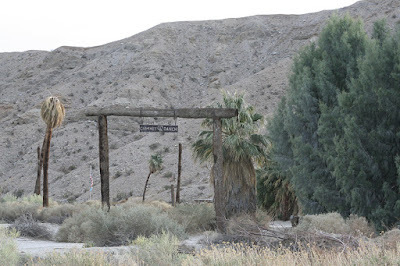 Chimney Ranch is out in Thousand Palms near Palm Springs. I haven't got a clue as to what the history of this place is. Anyone know? 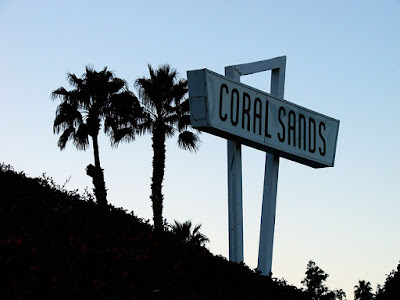 Built in 1952, the Coral Sands Inn is in the old Las Palmas neighborhood. There's a kidney-shaped pool. The home is in the neighborhood where Liberace, Elvis, Peter Lawford, and the Kennedys have lived. The motel has a Roy Rogers and Dale Evans Suite, the Liberace Room, the Yiddish Cowgirl Room, the a Poodle Room. 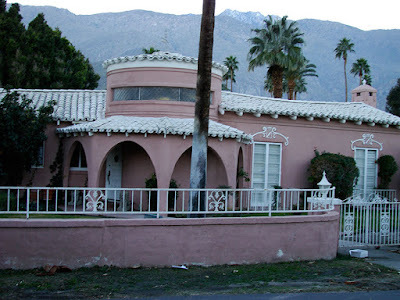 Please comment if your dream is a pretty pink house in the Movie Colony of Palm Springs. Just to lure you it got to 80 degrees here today. A beautiful day it was. 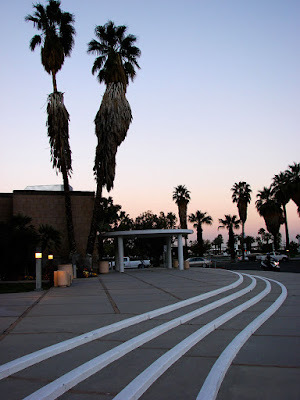 During the 50s Palm Springs City Hall, designed by Albert Frey and John Porter Clark and the firm of Williams, Williams & Williams, was built. Here you see something rarely talked about in discussions of the architecture of this building. The stairs leading to both entrances are curved concrete and lead ultimately to the sunset. Pearl McCallum McManus Pearl owned the Oasis Hotel, one of the first resorts in Palm Springs. She was the daughter of John McCallum, the first white person to settle in Palm Springs. 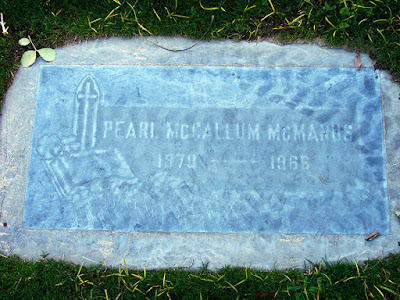 The picture to the left is Pearl's tombstone. It was taken at the Welwood Murray Cemetery in Palm Springs. Don't you just love this stuff? This was taken in the high desert about 45 minutes north of Palm Springs. 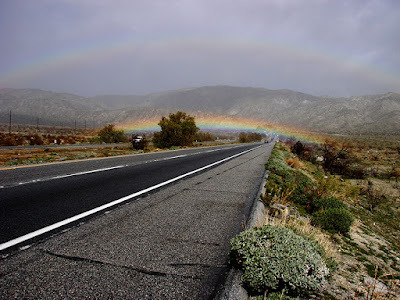 Now here's a real bridge--a rainbow bridge just outside of Palm Springs. It goes along with the sandstorms and hail we had last Sunday. Light from a rainbow can do some pretty strange things in the desert. 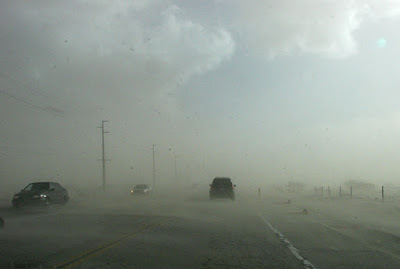 Wild sandstorms are striking Southern California today. Many roads and parts of Highway 10 have zero visibility. Winds are blowing 30 to 50 mph. Hail and heavy rain are being reported in some areas. Skies are partly cloudy to cloudy, perfect conditions for the many rainbows that are being sited. 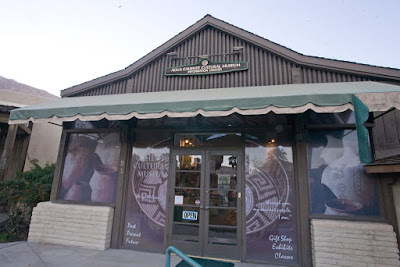 This is the current Agua Caliente Cultural Museum in the Village Green. One day it will be no more. A new one--a planned 100,000 square foot building-- will be opening in 2010. The new museum will be located on Tahquitz Canyon Way and North Hermosa Drive. Here's yet another T-bird. It looks like the other one I posted. Anyone know what year this car is. Dontcha just love the trailer? This pair of vehicles is in DHS. Someone told me it's an advertisement for a business.